File locations can now be added to the 'large white box' by right clicking on the box and choosing 'paste'. Any copied file locations will be inserted into the box. If the above lines are copied then they can be successfully pasted into the 'large white box'. This method will not check for the validity of locations. At work we have 5 Citrix servers with identical software on them. In order to keep them identical we have to replicate any changes we make to all servers. For in house software updates, we have to copy executables and required folders to all servers when we make a change to our software. To make such updates easier I have developed a program called CopyToLocs. This is a standalone executable that will run on any Windows XP or above computer and will allow you set a source file or folder and a number of destination folders. When the program runs it will copy the file or folder into all the destination folders. You also have the option to create a shortcut to a file, with a custom name, rather than copying the file to destination folders. You have the ability to save your source file / folder path and destination folder setting to an configuration file. This will allow you to repeat copy jobs easily. Download the program zip file. Double-click the executable to run the program. There are two tabs to choose from. One is labelled 'File' and the other is labelled 'Folder'. Click on the elipses (...) button to select the file or folder name. 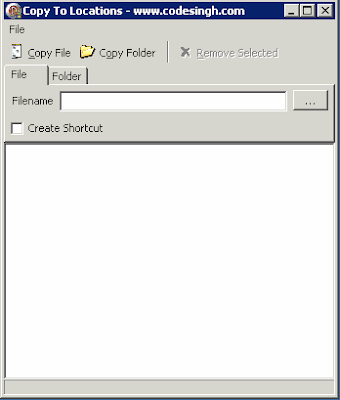 If you require to copy a file or folder as a short cut tick the box labelled 'shortcut' and enter a name for the short cut. Drag and drop, into the large white box, any folders that you would like to be destinations for the source file / folder. Click on copy file or copy folder to start the process. [optional] Click on File -> Save to save the setting for you file / folder copy. To load the saved settings click on File -> Load and navigate to where your settings are saved. If you have any comments or questions then please leave them in the comments section. It would be great if it were possible to do a copy and paste of destination locations, in addition to the dragging and dropping the destinations "into the large white box". I had a list of folder locations I wanted a folder copied to, and it would have been a breeze to use your program by pasting the list into the box. If it is possible to paste, I missed how to do it. 10. # [optional] Click on File -> Save to save the setting for you file / folder copy. And then opening the saved text file I saw the syntax of how the destination folders were listed, so added my list into the text file in the same structure, and it worked very well. Thank you for your nice (Great!!) program. I will have a look at a way of copying and pasting into the "large white box". Glad to see that you found a work around in the current version but I will still try to make it more elegant. I have updated CopyToLocs with the improvements suggested in the comments. Please download and see what you think. Then all the copying could be executed by one click.